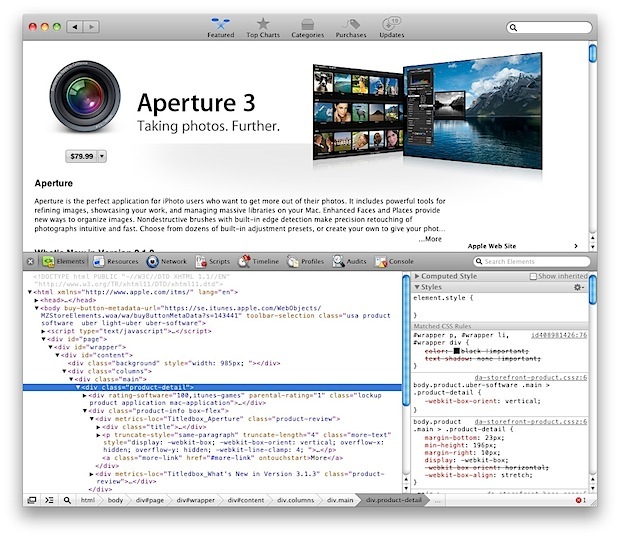 The Mac App Store has a hidden element inspector that lets you view the source of any page or element drawn within the App Store, letting you extract text or images, and even enter your own code into the console (which can lead to all sorts of fun things). This is probably most useful for web and app developers, but anyone with some curiosity might get a kick out of this feature too. Hit Return and then relaunch the App Store. You can now right-click to “Inspect Element” on anything, just like you would in Safari through the developer DOM inspector tool. As you may have guessed, this works because the Mac App Store is basically just a WebKit wrapper for a website. How do you enable it in the iOS app store? This is mostly for developers or anyone curious about the HTML, JS, and CSS behind the Mac App Store’s appearance.